Authors: Karen Meyer and Duncan Mackay are from the University of St Andrews, and Aad van Ballegooijen is from the Harvard-Smithsonian Center for Astrophysics. The magnetic carpet is the small-scale photospheric magnetic field of the quiet Sun. The motions of features in the magnetic carpet are dominated by the flow pattern of supergranules – large convective cells with an average diameter of 14,000 km , an upflow at cell centre, radial outflow of around 0.5 km/s and downflow at the cell edges . Magnetic features are swept to the edges of these cells and build up in concentrations at sites of strong downflow, forming the magnetic network. Magnetic features also evolve by emergence, cancellation, coalescence and fragmentation. The evolution of the magnetic carpet drives the dynamics of the overlying corona. This nugget describes our model for the magnetic carpet, which results in synthetic magnetograms based on observed properties that can be used to model the 3D coronal field above the carpet. Figure 1. The simulated supergranular flow profile of our model. Our model includes a mathematically specified supergranular flow profile, an example of which is shown in Fig 1. The computational box is periodic in x and y, and we include random motions representing granulation to prevent features from becoming stationary at the supergranule cell boundaries. The model includes the four processes of emergence, cancellation, coalescence and fragmentation, in a manner motivated by previous observational studies. (Clicking on the name of each process in the following text will show an mpeg example of that process from within our model). Following flux emergence , bipoles are swept towards the cell boundaries where they interact and form the magnetic network. Magnetic features may undergo fragmentation  at any time, where features of greater flux are more likely to fragment. Cancellation and coalescence are essentially the same process in the model; only the sign of the features’ flux distinguishes the two. Cancellation may be complete or partial. Figure 2. Mean magnetic field (G) versus time. Starting from a region that is initially empty of magnetic flux, we inject bipoles with a range of fluxes between 4×1016 Mx and 1019 Mx. The model quickly reaches a steady state, in which the rates of flux emergence and cancellation are roughly equal. 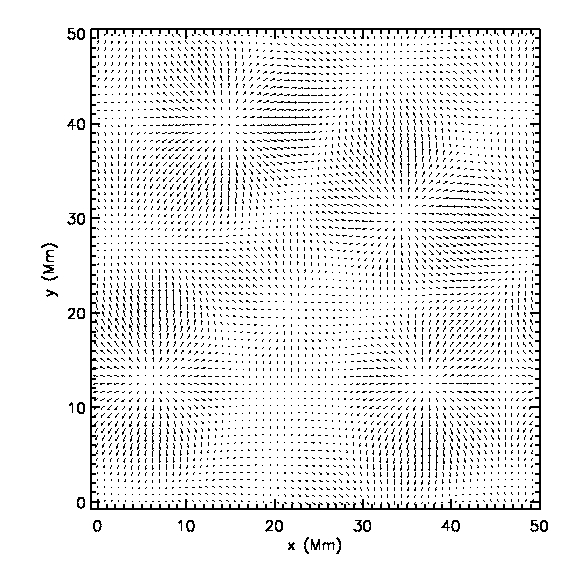 Fig 2. shows the mean field versus time for the simulation. The mean field levels off at about 6-7 Gauss after 24 hours, and a magnetic network forms. The image in Fig 3. shows that this network follows the outline of the supergranular flow pattern shown in Fig 1., with large magnetic features forming at the boundaries between supergranules. Although our flow profile is steady in time, this does not result in an unphysical build up of flux at the boundaries. The average lifespan of a magnetic feature in our model is 10 minutes, and the photospheric recycle time (mean field divided by emergence rate) is 1.48 hours, in agreement with previous observational findings [5,6]. Clicking on the image in Fig 3. shows an mpeg of one of our simulations after it has reached a steady state. Figure 3. 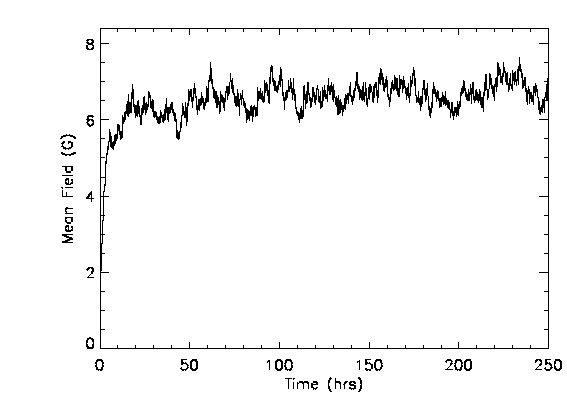 An example synthetic magnetogram. Red contours represent positive magnetic flux, blue contours represent negative magnetic flux. The model reproduces the main observed properties of the photosphere, and has several advantages for further simulations. We do not have to worry about noise and instrumental limitations. The total flux is always known and we can track even the smallest features. We also know exactly where and when each of the processes of emergence, cancellation, coalescence and fragmentation are occurring. This means that when we go on to simulate the coronal magnetic field we can more easily relate coronal processes to corresponding events on the surface. Our next step is to use the synthetic magnetograms produced by the model as the lower boundary in our 3D coronal magnetic field simulations. Fig 4. shows images from such a simulation, in which a selection of coronal magnetic field lines has been plotted. We model the coronal magnetic field using a magnetofrictional method which has been applied previously, for example, to simulate the global coronal magnetic field . Figure 4. Synthetic magnetograms with a selection of simulated coronal magnetic field lines. The image on the left shows contours of magnetic field (red=positive, green=negative), the image on the right shows the same frame with the surface magnetic field in magnetogram style. Dark blue field lines reach heights of less than 5 Mm, magenta field lines reach heights of between 5 and 10 Mm, and light blue field lines reach heights of over 10 Mm. Our realistic model for the solar magnetic carpet reproduces many of its observational properties, and can be used to investigate how the quiet photosphere drives the corona. Within the coronal model we will study, for example, locations of electric currents, null points and free magnetic energy. We will investigate how these depend upon the evolution of the photospheric magnetic field. A detailed description of the work presented in this nugget may be found in .